Yesterday got me thinking about flavorful vegetarian cooking. I have been a vegetarian (or, now, a mostly-vegetarian, with apologies to those who are offended by the concept) for my entire cooking life. So I have never relied on meat to flavor my food. What do I rely on? Vegetables, heat applied to vegetables, fat, salt, spices and herbs. I also know and revel in the range of textures and flavors that each vegetable can provide on the plate: a beet can be meltingly sweet and earthy or brightly crisp and bracingly imbued with lemon or ginger. Fennel can be a licorice tangle of crunch, a whisper of greens in a salad, or carmelized to a sweet and savory mush that is barely haunted by anise flavor. And I get excited every time I discover a novel way to cook a vegetable. By way of illustrating the range of a humble vegetable, I thought I’d share a very simple but utterly delicious recipe for roasted cauliflower. Compare it to this simple, creamy 5-ingredient Cauliflower Soup (cauliflower, onion, olive oil, water, salt). Compare it to this Smoky Cauliflower Frittata. You can take a cauliflower in a lot of directions. But once it’s roasted, that’s pretty much the end of the line for a cauliflower in our house. It often gets eaten off the sheet pan before dinner is even on the table. Roasted Cauliflower: Chop one head of cauliflower (or two, if you want one left to put on the table with dinner) into medium florets, and chop the remaining stem into slightly smaller pieces. If the leaves are large, chop them as well, otherwise leave them whole. Pile onto a roasting pan, including the tiny bits–these will brown into delicious little salty bites. Toss with olive oil and salt and roast at 450. Turn with a tongs after 20 minutes, then every 10 minutes after that, until they are nice and brown on all sides (about 45 minutes total). Hide from passers-by until serving. This entry was posted in My Favorite Recipes, Vegan or Would-Be-Just-As-Good-Vegan, Vegetables By Themselves and tagged cooking, food, lifestyle, recipes, vegan, vegetarian on February 16, 2012 by emmycooks. This sounds entirely like the perfect, healthy snacking food.. move over popcorn! Love this! My family makes a dish with caulifower,sour cream and cheddar cheese. The is much healthier and tastes just as good! My eldest daughter taught me to roast cauliflower this way and I’m loathe to cook it any other way now. It is too delicious! Looks scrumptious. Cauliflower and roasting were almost made for each other, don’t you think? I was a vegetarian for over a decade, which never fails to shock my friends as most of them have only ever known me as being a militant carnivore. But I have to say that I would never be the cook that I am without having learned how to make something wonderful and delicious without meat first. I love your blog; every post reminds me of why I love food and cooking. Thank you! I love roasted cauliflower and often serve it as a side. 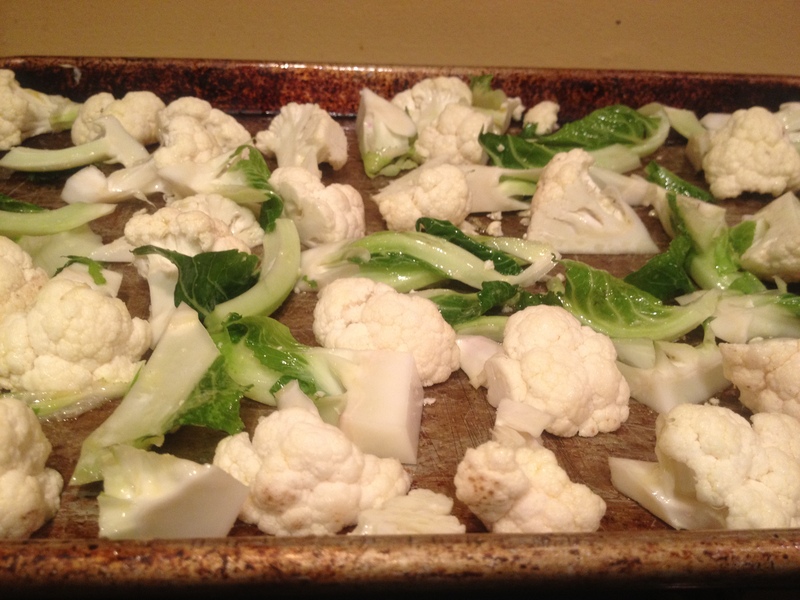 Have you ever tried to steam the cauliflower first? I think it makes for an interesting change in texture: more tender on the inside and more crunchy on the outside. Make sure to let dry well and drizzle with olive oil before roasting. Apologies if you receive this reply twice; I thought I had responded, but I don’t see it posted here! I usually just roast without steaming, since it’s faster, but I do think the texture you’re describing sounds appealing! And I like experimenting with the full range of what a vegetable can do, so I will try steaming my cauliflower first next time! Thank you for the tip. Tonight I’m trying roasted cauliflower WITHOUT steaming first. Did you try pre-steaming yet? 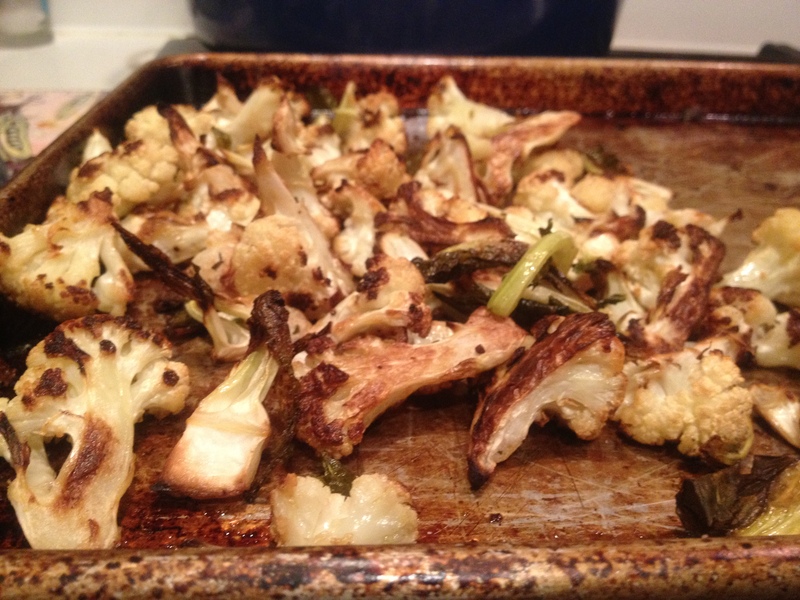 I have never tried roasting caulifower but it sounds and looks so wonderful! I’ll be trying this soon. I have to do this. Our house has sort of metamorphosed into a vegetarian zone over the last 5 years and I shall be following your blog. Roasting cauliflower seems so obvious, yet I’ve never done it.